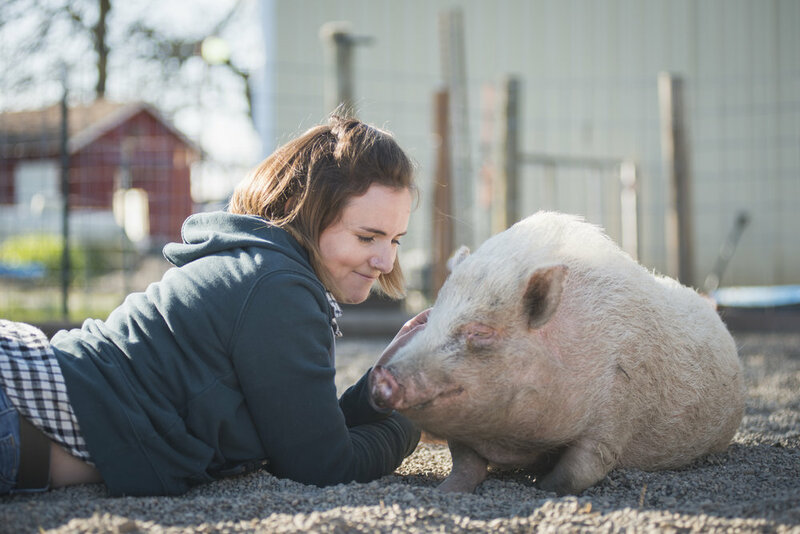 Gwen Jakubisin, Executive Director of Lighthouse Farm Sanctuary, lies down with a pig that was rescued from a research facility that performed traumatic wound testing. Now the pigs live on the sanctuary with 200 other animals. Lighthouse is home to a diverse group of animals that all live together on the property. Gwen Jakubisin and her husband, Peter Jakubisin, are the sole caretakers of the animals. Jakubisin leans on a gate and rests for a moment from her nightly chores. The workload at the Sanctuary is intense, and Gwen and Peter made the choice to quit their jobs to care for the animals full time. Jakubisin cleans the stalls while she is watched intently by two goats. The goats follow her around while she does her chores and she scratches them affectionately on the heads. Jakubisin pets two of her dogs, Buttons and Hefe. 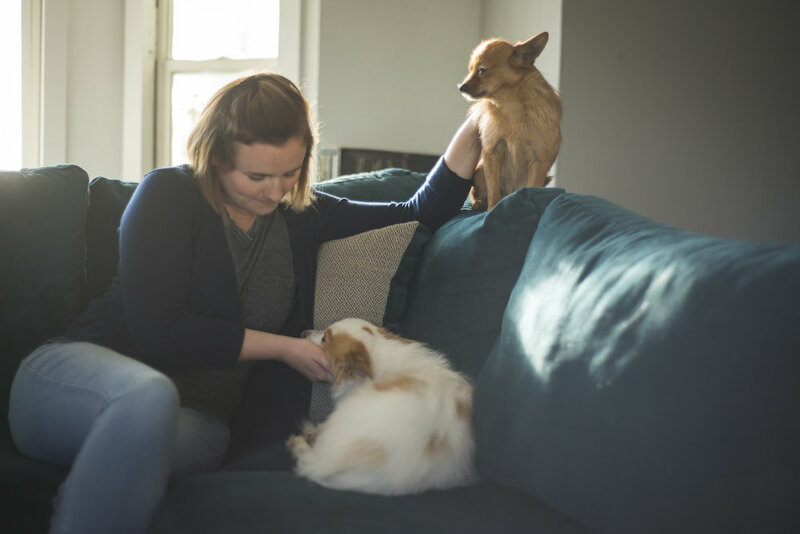 In addition to taking care of the 200 animals, she also enjoys the company of four companion dogs and one house pig. Jakubisin and her husband are ethical vegans. 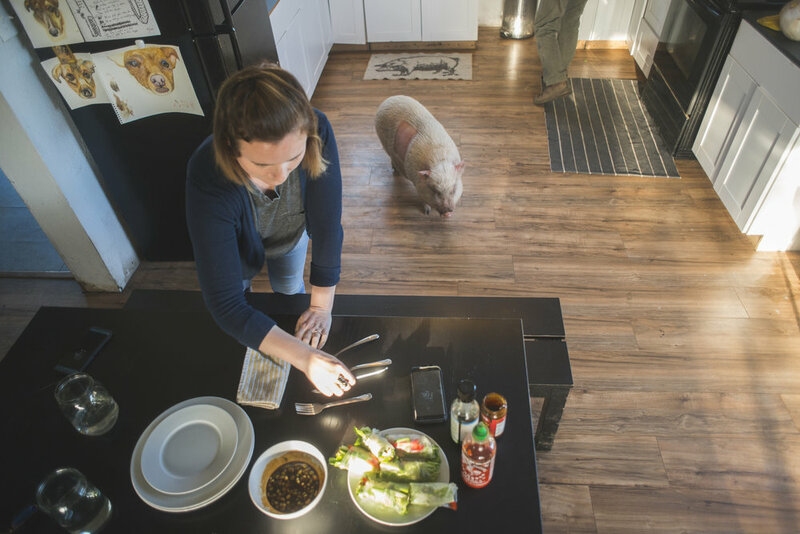 The slogan, "Eat figs not pigs," becomes more understandable once you meet Emma, a pig that lives in their house. Emma the pig recently suffered a health problem and was rushed to Oregon State University for treatment. While she is on the mend, Emma lives in the Jakubisin house and has free reign over the kitchen. The Jakubisins enjoy a vegan meal together in their farm home. Peter used to be a gourmet chef in Seattle and still uses his skills to cook delicious plant based meals. Jakubisin drives an ATV back into the barn. She uses the vehicle to transport manure to the back fields where it is kept away from water sources. After a long day, Gwen Jakubisin relaxes in the golden light. In the morning, she will wake up around 6:00am to do it all again.